I don't believe in "fate," but I'm a big fan of serendipity. Last week, Frod Jr. had to get to Cornell University on Saturday morning, where he's taking courses this summer. It turns out this is not a simple task, as there are almost no flights into Ithaca. Things actually got a bit easier when I needed to be in New York City for work earlier in the week. Frod Jr. came up with me, and had a couple days free in the city before we rented a car and drove to Ithaca. That worked out perfectly. Then Thursday night while we're up there, I get a text from Miami chef Jeremiah Bullfrog, who had just been at Bonnaroo breaking in his new gastroPod, a diner built in a shipping container: "You in NY??" he asks. Sure enough, he is too, and we've both got Friday night free for dinner. I scour OpenTable to see what's available, and – can this be for real? – there's a 9:30 reservation for three open at Atera. A place I've been wanting to go to since it opened, and for which Friday night tables are usually booked weeks ahead. Should we do it, Jeremiah? "Yes yes yes." And this, too, worked out perfectly. The chef, Matthew Lightner, who had spent time at Noma and Mugaritz, was getting lots of attention for his "modernist" interpretation of Pacific Northwest cuisine at Castagna in Portland when he switched coasts to open Atera in 2012. It's easy to see how he was lured away: Atera is many a chef's dream come true. Hidden behind an unassuming entrance near Tribeca is a snug room with twelve seats around a matte black concrete counter facing into a gleaming open kitchen. One twenty-ish course tasting menu is served to two seatings every night, and Lightner and crew seem to work with absolute freedom. 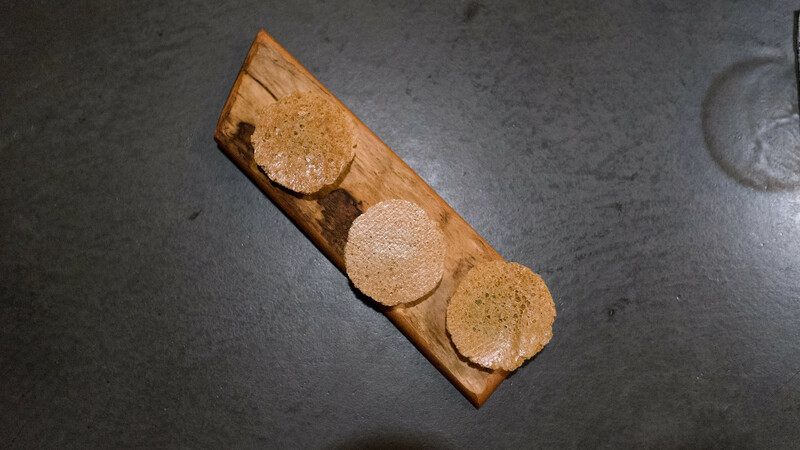 When Atera first opened a couple years ago, that freedom was reflected in provocative dishes like pig's blood crackers and lichen crisps. From my recent meal there, it seems those confrontational inclinations have been tempered. This is not "comfort food" by any means – the creative impulses that fuel the menu remain readily apparent – but I left feeling more coddled than challenged, in the best possible way. (You can see all my pictures in this atera flickr set; and though I don't usually toot my own horn, seriously, go look – I don't think I've ever been quite as happy with my own pictures). A burst of color starts the meal. A tranche of vermilion and white king crab rests in a pool of cool, crimson rhubarb juice, infused with wild ginger and dotted with fresh cream, topped with a few fragrant rose geranium blossoms. The crab is both lush and lean, a balance echoed by the thick cream floating on the surface of the tangy rhubarb. An even more colorful bouquet followed. 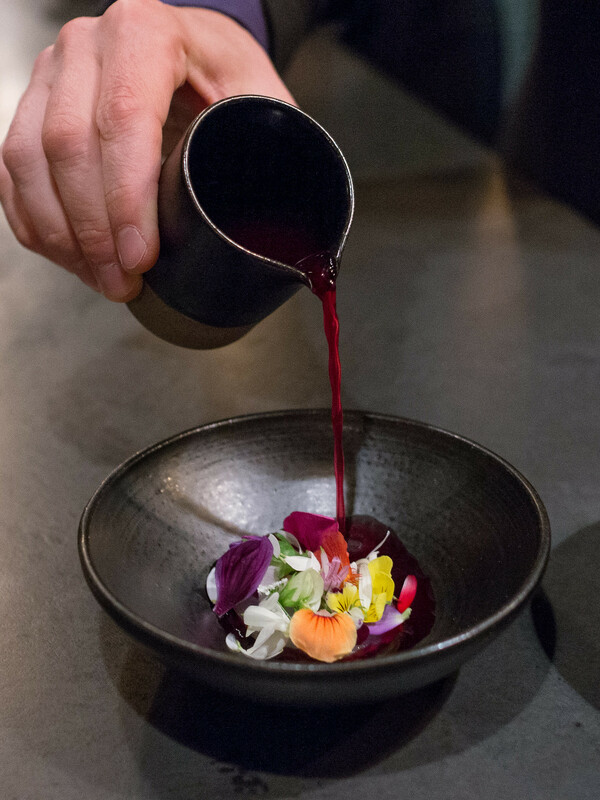 For a while, everyone was throwing edible flowers onto their dishes in imitation of Noma's "forager cuisine." 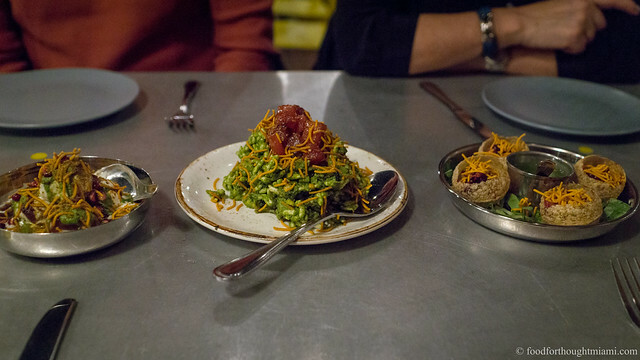 Too often, it was this generation's equivalent of the parsley sprig – a garnish, arguably edible, but having no real relationship to the dish other than to look pretty. 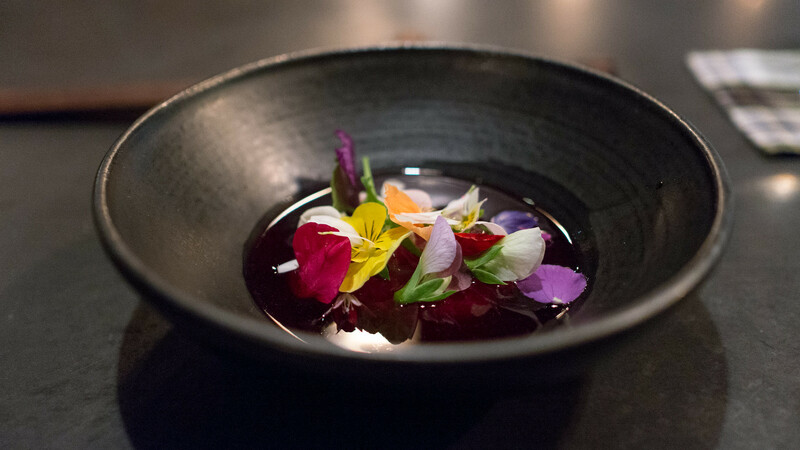 Here, the flowers are the heart of the dish: a ruby-hued broth of rose hips and petals, poured tableside into a bowl with slices of black bass and a spray of various blossoms. 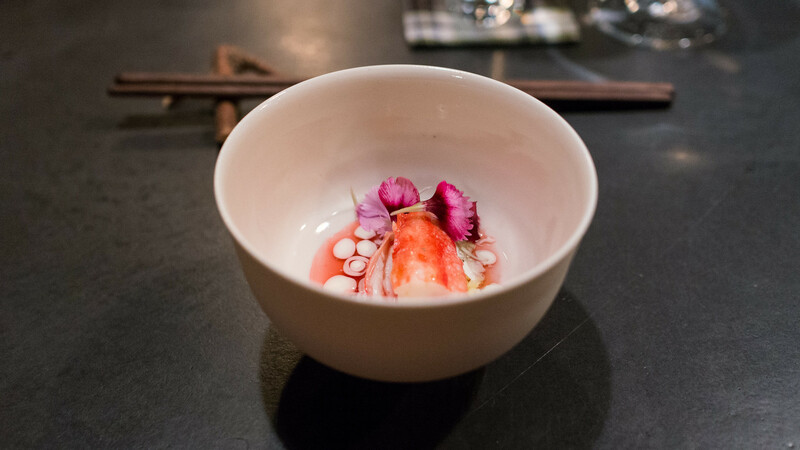 The broth was intensely floral, but the acidity of the rose hips (a common source of Vitamin C) tempered the suggestion that you were digging into a bowl of potpourri. A very light charcoal-grilled sear on the fish – so clean and fresh – helped keep it from getting lost. Then, a sort of "nose to tail" triptych of trout. 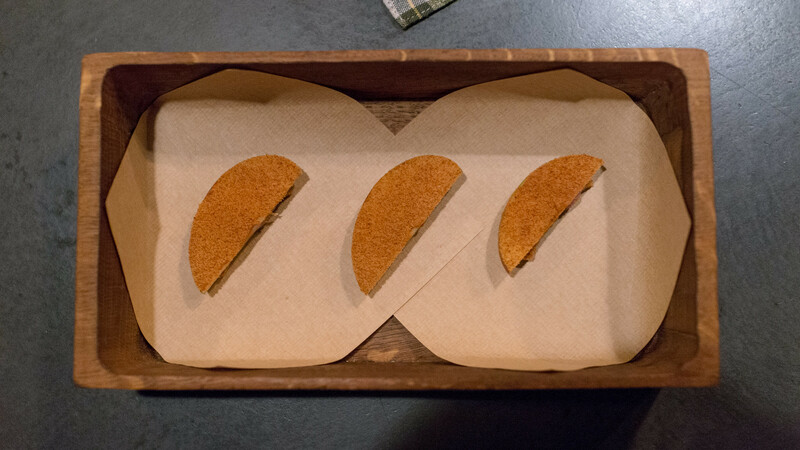 First, trout liver, packaged into a sort of sandwich with apple, toast and powdered brown butter. 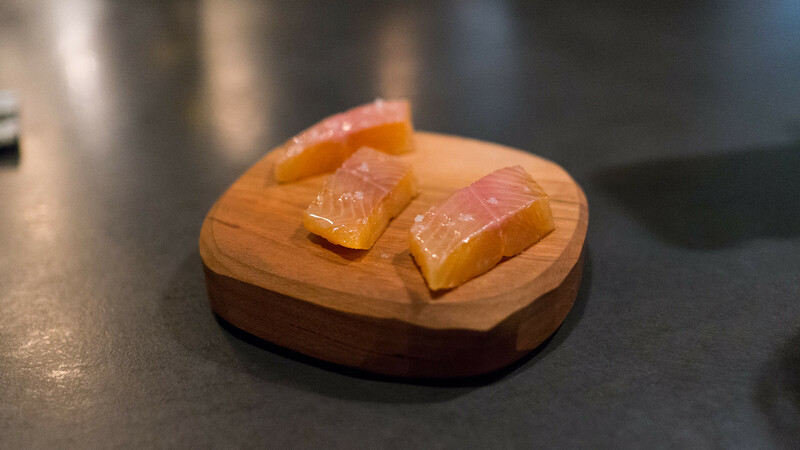 Next, slabs of the trout filet – cured, smoked, and brushed with pork fat, presented entirely unadorned – a perfect bite. Finally, smoked trout roe, with a clean brininess that pops in your mouth, sandwiched between crisp, lacy amaranth crackers, bound with a bit of tartar sauce. I usually don't write about restaurants based on off-the-menu experiences, particularly those of the "cook for me" variety. But exceptionalism is cause for making exceptions. 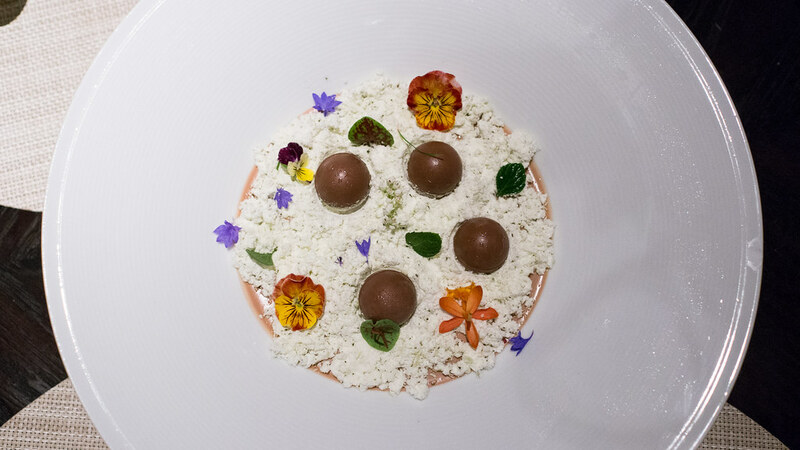 Chef de Cuisine Bradley Kilgore and Executive Pastry Chef Antonio Bachour are doing exceptional things right now at J&G Grill in Bal Harbour, and it seems foolish not to speak of them. I've been talking Brad up for years, going back to our Cobaya dinner at Azul in 2011 where he was a sous chef at the time. After a brief stint heading the short-lived Exit 1 on Key Biscayne, Brad landed as chef de cuisine at Jean-Georges Vongerichten's J&G Grill in the St. Regis, where he's finally had the resources to match his talent and ambition. He also has had the benefit of teaming up with Antonio Bachour, whose pastry work is, and I don't exaggerate, brilliant. To celebrate a recent birthday, the family let me choose where to go, and I quickly opted for J&G. The truth is, while I've tasted Brad and Antonio's work on several occasions, most often it has been at special event type things. I wanted to have a full-blown dinner there, and yes, I did kind of want to lay it on thick: it was a birthday after all. So I asked them to do a tasting menu for the family. And it was easily one of the best meals I've had in Miami this year. 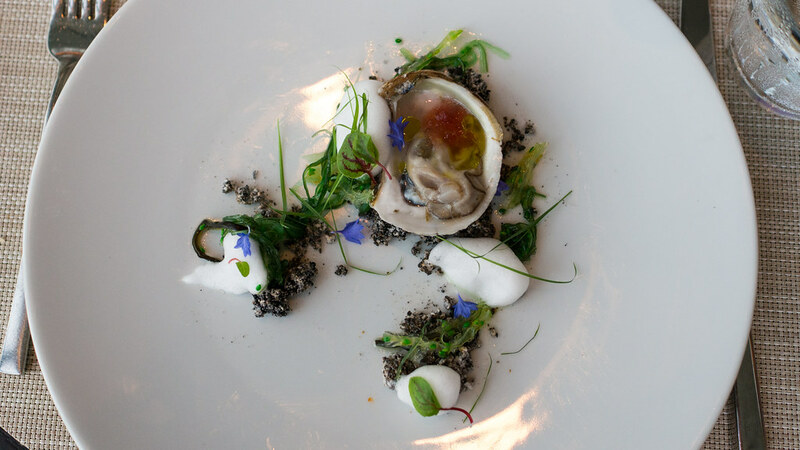 To start, oysters "in their natural setting:" a freshly shucked oyster, swimming in a mignonette gelee, perched on a mound of squid ink and salt "sand," with various seaweeds strewn about and puffs of verjus foam washing up here and there. 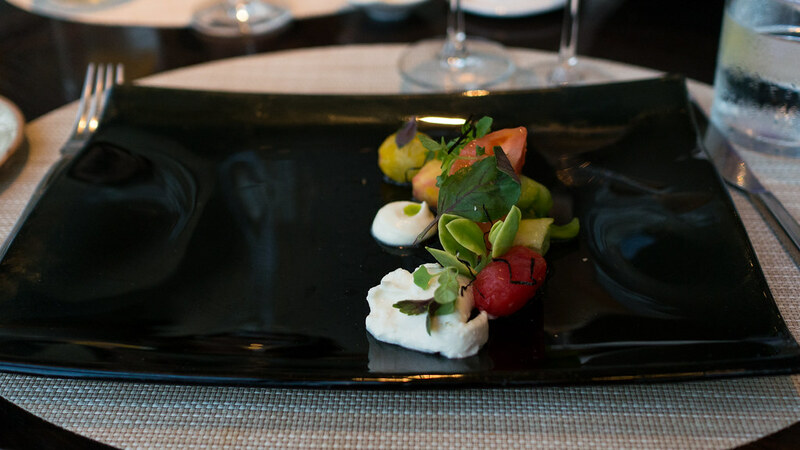 It's a gorgeous presentation of the clean, fresh flavors of the ocean – the only flaw is that the squid ink "sand" is too salty to really be edible (something our server warned us of). A variation on a dish from the regular menu: oozy burrata cheese, paired with ginger glazed heirloom tomatoes, tiny herbs and greens, and a drizzle of shiso oil. The ginger and shiso are unexpected accompaniments, each with a razor's edge sharpness that cuts through the lusciously creamy cheese. 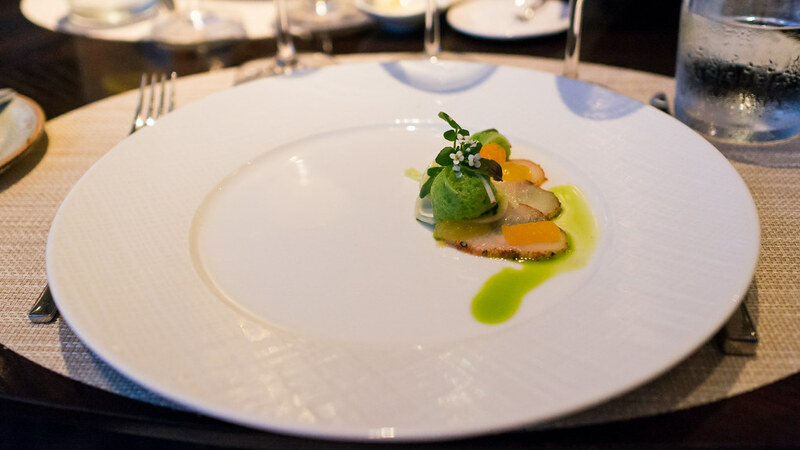 J&G's sommelier, Luis Mejia, was particularly proud of his pairing for this course – the Leitz Dragonstone Riesling – and for good reason, as its balance of honeyed fruit, spice and acidity was an ideal match for the dish. The next course was a variation on a dish Brad had served me a couple years ago: slices of togarashi cured cobia, topped with bits of citrus, a puffy basil meringue, and delicate but assertively flavored watercress flowers. Dessert techniques – meringues, mousses, and sabayons, for instance – regularly weave their way into Brad's savory dishes to good effect.